The new EX-R series has been extended by incorporating models from the best selling EX series. By adding four digit meters and switchable remote sensing, the EX-R series offers much higher precision whilst retaining the simplicity of operation which many bench-top power supply users prefer. Six models are offered including single, dual and triple outputs and covering a power range of 175 watts up to 420 watts. The EX-R series incorporates separate voltage and current meters on each main output with a resolution of 10mV and 1mA (10mA on higher current models). The fixed resolution avoids the misinterpretation of readings that can occur with auto-ranging 3 or 3½ digit meters where the decimal point position moves as the reading changes. Each main output incorporates remote sense terminals that can be enabled or disabled at the flick of a switch. Remote sensing is essential for maintaining precise regulation at the load and true metering of the load voltage. Many other power supplies omit remote sense, and quote regulation figures that could never be achieved in a practice. Each main output has a DC on-off switch. This enables voltage and current settings to be viewed before the load is connected and allows multiple outputs to be controlled individually. Surprisingly, many power supplies omit this essential feature. Each main output can operate in constant voltage or constant current mode with automatic crossover and mode indication. Coarse and fine voltage controls are provided. The current control is logarithmic enabling low current levels to be set accurately. 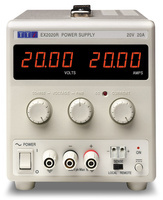 EX-R series power supplies use classic analog controls for voltage and current. The large and bright displays have a fixed resolution to avoid confusion. Preset voltage and current levels are shown when the DC output switch is turned off. Remote sense is available when needed but is disabled by setting the switch to Local.